Fundraising is a major part of any business, foundation or agency. Yes, you have revenue from the merchandise or services that your company provides, but extra capital to make upgrades, improvements or expansions have to come from somewhere. So, you begin to make plans to put on a fundraiser. While you are setting your committees, lining up sponsors, and making lists; having a Fundraising Budget Template to keep track of it all will make the difference in a well run fundraising campaign and a frustrated atmosphere. It is good to have a tracking system that is easy to use for the fundraiser chairperson. But, if it is too complicated to present to others, then you will lose much needed participation in the translation. This template is easy to use by the chairperson and easy to read by all other interested parties. The Fundraising Budget Template can be downloaded for free right here on this page and it is easy to use. Once it is downloaded, then the template can be customized to the individual needs of your organization. Just fill in the event name and the monetary goal and you are on your way. As you begin to prepare for the event and receive donations, you can input these figures into to fundraising budget template and it will display the total expenditures, total donations, and the amount needed to reach your goal. There is also allocated space for the breakdown of donations and expenditures by source and use. The easy to read pie chart will display the ratio of amount collected to the amount expended. 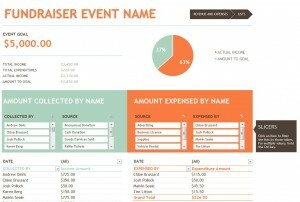 The template can be used to update sponsors and potential sponsors on the progress of the fundraiser. It can be customized to show the individual’s charitable gift or service donation. The template can be used by the different committee leaders to track their teams progress toward the total goal. And with their bottom lines documented, the fundraising chairperson can compile the numbers to track the organization’s total progress toward their fundraising goals.